Protect your store from the three big revenue killers: order fraud, advertising fraud, and poor performance. Reduce your store’s chargebacks, increase the effectiveness of your ad campaigns, and ensure quality of your site’s user experience. 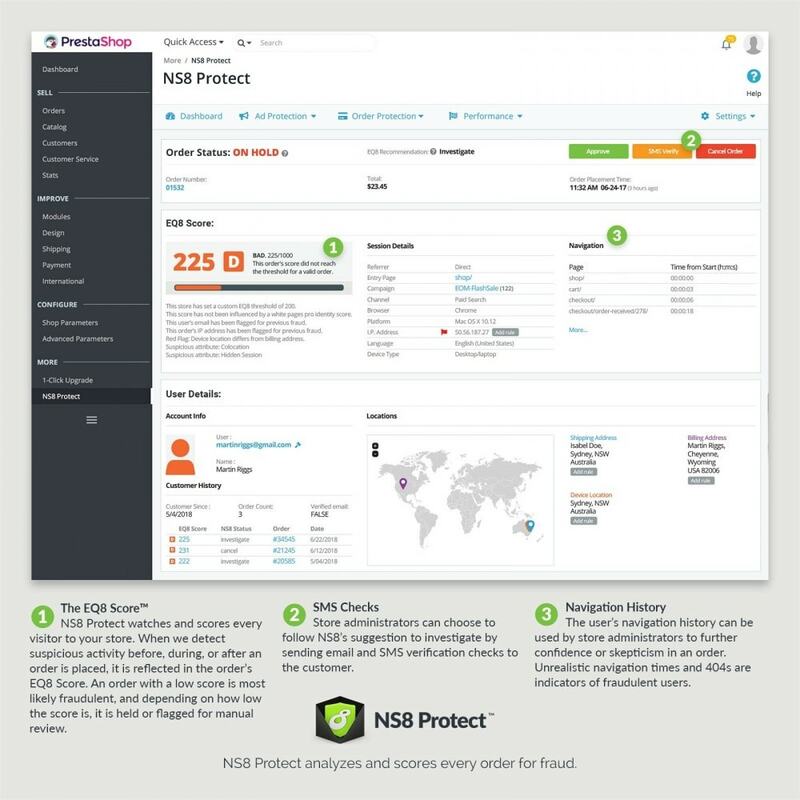 NS8 Protect uses industry-leading techniques in behavioral analytics, real-time user scoring, and global monitoring to identify bots and other malicious activity in your storefront. As a platform-based approach to online threat reduction, NS8 Protect is designed to help your store fight the three big revenue killers: order fraud, advertising fraud, and poor performance. NS8 Protect includes 5 critical monitors that every PrestaShop store should have. If and when an issue arises, escalating text messages are sent to you and your staff warning of potential or actual problems. Every action taken by a visitor to your store is scored by the EQ8 Scoring Engine, which functions a lot like a credit score. For example, a high score is awarded when a user displays characteristics of being human, and a low score is awarded when the user is found to be deceptive about their identity, location, device, etc. NS8 integrates order scoring right into PrestaShop's default order queue, so warning icons will appear next to suspicious orders that exhibit fraud markers. Discover which campaigns and sources are responsible for the most low-quality traffic. This lets you direct your budget towards campaigns that score well and actually deliver. Don't waste revenue by remarketing to bots. NS8 blocks bots and other deceptive users from getting tagged for retargeting. This lets you do things like set an EQ8 Score threshold to add users with high scores to remarketing audiences and get a better picture of your good customers. Instantly request SMS or email verification from the customer on any suspicious looking orders. Every plugin added to your store can negatively impact the speed, performance and customer experience of your website. NS8 monitors your website’s performance from a global view and alerts you if there is an issue. If you rely on email marketing to drive customers to your store, finding your domain on a spam list could be seriously damaging to your reputation... and your bottom line. NS8 Protect monitors the largest spam block-lists for your domain and alerts you via email or SMS so you can address this crucial issue. NS8 protects storefronts from load performance issues and downtime, so you can guarantee that everything is up and running when users visit and that frustrating display issues are taken care of. NS8 tracks over 157 attributes to assess potential fraud, meaning that fewer legitimate customers have their orders inadvertently declined due to overzealous traditional fraud prevention methods. No coding or site changes required! We handle the integration via the PrestaShop APIs, so no additional integration is needed on your part. Once you install the app, just turn the features on and you will have your shop protected immediately. It really is that simple. Erweitertes Anti Spam / Spam Protect PrestaShop-Modul schützt Ihren Shop gegen mehr als 2000 Spam- und Einweg-E-Mail-Anbieter, einschließlich qq.com, mail.ru, 163.com, 126.com, spam4.me usw.